When it comes to teacher quality reform, it is clear that the National Education Association likes to talk from both sides of its proverbial mouth. 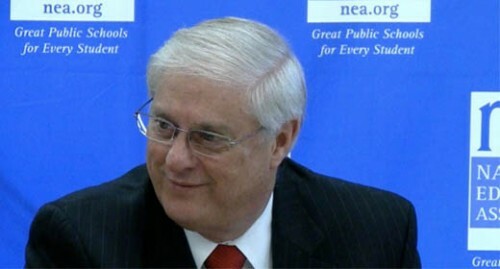 Even as its president, Dennis Van Roekel, proclaims support for efforts such as the proposed ed school accountability plan proposed by U.S. Secretary Arne Duncan, the nation’s largest teachers’ union works hard to successfully scuttled efforts such as the recently-excised proposal in the Harkin-Enzi plan for reauthorizing the No Child Left Behind Act that would have required states use student test score data in teacher and principal evaluations. It would be nice to think that the NEA signed on to this letter because it actually cares about helping poor and minority kids get high-quality teachers. But that would require your editor to suspend all forms of reasonable skepticism. The real issue has actually has little to do with preserving the No Child’s Highly Qualified Teacher provision — which even most reformers agree is already rather meaningless thanks to moves by states to grandfather in veteran teachers. Instead, it is about the longstanding effort by the NEA and their allies among the nation’s university schools of education to stop the expansion of Teach For America and other alternative teacher certification programs, the vanguards of the teacher quality reform movement. Under Harkin-Enzi, new teachers trained by TFA, The New Teacher Project and other alternative teacher training outfits could be considered Highly Qualified under federal law. The proposal, in part a response to a federal Ninth Circuit Court of Appeals ruling handed down last year that struck down efforts to allow those aspiring teachers (many of whom hadn’t yet received full certification in California and other states covered by that appellate court) to be considered highly qualified under federal law. Congress allowed for this to happen last year during one of the many wranglings over the federal budget. But now, Harkin and Enzi are pushing to ensure that it remains codified under No Child, the latest version of the Elementary and Secondary Education Act that is the centerpiece of federal education policy. This doesn’t sit well with either the NEA or its fellow-travelers among the nation’s ed schools, which train all but a smattering of the nation’s 200,000 newly-minted teachers entering the profession. So they have recruited Sanders — who has never met a teachers’ union proposal (or any union plan) he didn’t like — to counter Harkin’s and Enzi’s plan on this front. Under his proposal, TFA and TNTP trainees couldn’t be considered Highly Qualified until they either passed state certification or been trained in an ed school (or other state-approved teacher training program). This would particularly hurt TNTP, the offshoot of TFA, which provides new teachers to some of the nation’s most reform-minded districts. Add in the fact that 23 states don’t allow for any alternate teacher training programs of any kind, and suddenly, you now have new restrictions on innovative ways of training teachers — which would certainly please the ed school crowd. But this argument over certification is senseless. A decade of research has largely proven that there is little correlation between a teacher’s certification and their success in improving student achievement. Essentially, the nation’s system of teacher certification has largely been a failure when it comes to ensuring high-quality instructors for traditional public and charter schools, regardless of the backgrounds of the children they serve. And No Child’s Highly Qualified Teacher provision, while a good idea when it was first enacted as part of that law’s passage a decade, is not worth preserving in its current form, especially in an age in which we have some tools to identify high-quality instructors. What is starting to come to fore is that there is some slight correlation between the kind of institution training aspiring teachers and student achievement. And in some cases, the ed schools are coming up short compared to their alternative counterparts (many of which, by the way, are affiliates of these very ed schools). In Louisiana, for example, TNTP was the state’s top teacher training program when it comes to mathematics, with its graduates performing two times better than the best traditional ed school, housed at the University of New Orleans (UNO’s graduates, in turn, only slightly outperformed their traditional ed school peers). And over the past few years, studies have shown that TFA grads either perform as well or outperform their traditional ed school counterparts. The real issue isn’t that TFA trainees and their colleagues from other alternative certification programs shouldn’t be designated Highly Qualified. The real issue is that the current system of recruiting, training, paying and evaluating America’s teachers is ineffective in ensuring that every child has a chance at being taught by a high-quality teacher. From the reality that 54 percent of teachers are trained at universities with low entrance requirements, to the abysmal quality of teacher preparation by many of those schools, to the system of seniority- and degree-based pay scales that reward teachers for merely occupying space instead of for successful work in helping children succeed, to seniority-based privileges that allow experienced teachers to leave schools serving poor kids for what they consider to be better spots (and also allow laggard veterans to bump better-performing junior colleagues from their assignments), all of our children — especially our poorest and minority kids — are cheated out of high-quality instruction. Sanders’ amendment won’t do a wit to solve this problem. What can improve teacher quality — and help every child get the high-quality teaching they deserve — is the restructure of the entire process of recruiting, training, and managing the performance of teachers. One step in achieving this element of systemically reforming education lies in requiring the use of Value-Added analysis of student test data in evaluating teachers, something that the Harkin-Enzi plan for revamping No Child originally aimed to do. But the NEA, along with the American Federation of Teachers, strongly opposed that effort (along with the Obama administration’s Race to the Top initiative, which has nudged states such as New York in taking those steps). The NEA would also likely oppose one of Dropout Nation‘s suggestions for teacher quality reform: Launching a Race to the Top-styled program that would award states and districts additional dollars in exchange for abolishing near-lifetime employment for teachers in the form of tenure (one of the reasons behind the abysmal quality of America’s teaching corps) and enacting laws that would only allow a teacher to be considered high-quality after proving that they can improve student achievement consistently over the first five years of their career. After all, they would lose more than a few dues-paying members. Add in the fact that the NEA continues to finance the efforts of ed schools to avoid reform — including $252,262 the union gave in 2008-2009 to the American Association of Colleges for Teacher Education, the main trade group for ed schools — and it’s hard to take the NEA seriously when it comes to the matter of teacher quality. Actually, when it comes to actually doing something to improve the teaching profession — and helping poor and minority kids get high-quality instruction — the NEA doesn’t live up to the mission statement Van Roekel touts constantly during his speeches. But this is one matter that can’t be laid at the feet of the NEA alone. A number of the signatories that are supposed to be dedicated to improving education for black and Latino children — including the NAACP — also deserve look askance for joining common cause with the union for supporting amendment that will actually do little to improve teacher quality. The NAACP, which hasn’t covered itself in glory on the school reform front, should be particularly ashamed for continuing an alliance with the NEA that harms the very black children it vows to protect and defend. The idea is that we must understand the fundamental assumptions and logic of the material we teach.